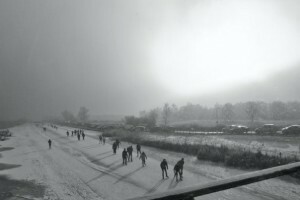 When it is cold enough, lakes and canals freeze over and you can go skating on them. The dutch go crazy over this “natuurijs” (literally – natural ice, as opposed to artifical ice). On new year’s day, some of our team took it upon ourselves to sample this experience.